Orchestral trumpeter Andrew Balio has been principal of the Baltimore Symphony Orchestra since his appointment to the position by Yuri Temirkanov in 2001. For the 2014-15 season, he will also be principal of the Oslo Philharmonic under the baton of Vasily Petrenko. From 1990 to 1993, he served as principal of the Orquesta Sinfonica del Estado de Mexico; and in 1994, Zubin Mehta appointed him principal of the Israel Philharmonic, where he stayed through 2001. The 1999-2000 season had him serving additionally as principal of the Bergen Philharmonic when not needed in Israel. Balio has been a frequent soloist since his earliest days as a student, having made his debut at the age of 15 playing Haydn’s Concerto with the Milwaukee Symphony in his home state of Wisconsin. Over the years, he has appeared as soloist with various orchestras in Europe, the us, South America, and Asia under the batons of noted conductors Mehta, Venzago, Herbig, Temirkanov, Rozhdestvensky, and McGeegan. His Carnegie Hall solo debut, an important milestone for musicians, came in 2013 in the company of the Moscow Chamber Orchestra and Maestro Constantine Orbelian. 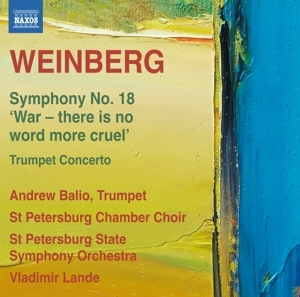 Naxos has recently issued his first solo recording, the Weinberg Trumpet Concerto with the St Petersburg Symphony, inaugurating a string of other recording projects planned to document his repertoire. Performing in churches with an organist has remained his favored context ever since his first studies in Wisconsin when he filled nearly all his Sunday mornings with performances around town. In recent years he has partnered with renowned German organist Felix Hell. Bach’s 2nd Brandenburg Concerto has also been a staple of most concert seasons since his days with the Israel Philharmonic. His focus has been purely orchestral since his first rigorous studies at the age of 14 with former Oberlin Conservatory professor Gene Young who was himself a close pupil of the New York Philharmonic’s and the Juilliard School’s William Vacchiano. The young Balio was soon introduced to the Chicago Symphony’s Adolph Herseth, almost by chance, after a wind ensemble concert that Young had conducted, and this began a five-year association centered on occasional lessons. Concurrently, Young’s methodical instruction gained entrance for Balio to the Tanglewood Music Festival when he was 15, and there he began much-needed studies in solfeggio with Roger Voisin. There he also met his primary and most influential mentor, Charles Schlueter, the newly installed principal of the Boston Symphony after storied decades with the Cleveland and Minnesota Orchestras. Schlueter offered a place, and ultimately a full-scholarship, for him at New England Conservatory, which Balio briefly attended. While his conservatory studies were quite brief, his apprenticeship and friendship with Schlueter were lasting, and they provided him much experience at the master’s side and as a substitute with the Boston Symphony. There was a four-year period starting at age 19 when Balio took leave from the trumpet and the conservatory — a quitting, in fact — and during which time he turned to immersive study within a Hindu ashram that was formerly a Jesuit monastery. It was during these intensive years of daily meditation, yogic austerities, renunciation, lessons in classical Vedic philosophy and Sanskrit as well as in Catholic theology and principles, and visits from many of India’s enlightened monastics, that he gained a renewed capacity for learning that presaged his eventual return to music making. A major feature of yogic breathing practice for meditation, pranayama figured prominently in his newly integrated approach to the trumpet. This knowledge was an ideal addition to the breath-centric wisdom of Schlueter and Herseth — together affectionately called the Midwestern Brass School. Another chance meeting at the ashram, this time with Israel’s greatest Klezmer musician and former ipo clarinetist, Giora Feidman, serendipitously turned Balio towards joining his fellow musicians again. The philosophical Feidman exhorted Balio not to play just as an occasional hobbyist but to work towards being a musician full-time — to dedicate himself to our art and its practice, while throwing caution to the wind to take a more adventurous path beyond the usual concern of playing correctly. Through no apparent connection to Feidman, five years later, Balio was playing in the Israel Philharmonic, having caught the attention of Mehta during the Shira Music by the Red Sea Festival under the direction of Maestro Lorin Maazel. The last and still emerging chapter in this biography is the establishment of The Future Symphony Institute, a nonprofit think tank for bringing together the best minds and expertise from outside the arts to bear on the various challenges facing orchestras and classical music in the us and worldwide. This new venture was borne of the cumulative experience gained in the years at the ashram, in Mexico and Israel, through extensive worldwide touring, and during the difficult years that the budding Baltimore Symphony has endured. Please visit the Institute’s website at www.futuresymphony.org to learn more about the future of classical music.